Native American flutist Golan? 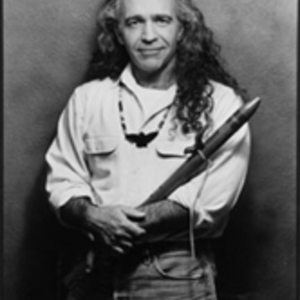 began a spiritual quest 20 years ago that completely changed his life, resulting in the discovery of his Cherokee Indian heritage, the development of his flute playing, and the recording of three nationally-released albums (the latest, Feather on the Wind, debuts in the Top 10 on the New Age Voice "Airwaves Top 100" chart). "Although I play mostly wooden hand-crafted Native American flutes, I don't play traditional American Indian music," explains Golan?. "Although I play mostly wooden hand-crafted Native American flutes, I don't play traditional American Indian music," explains Golan?. "I wasn't raised on a reservation or taught native traditions by my grandparents, so I bring sounds to my music that influenced me when I was growing up -- church hymns, songs like 'Desperado' by The Eagles, and classical composers like Chopin and Mozart." Golan? considers himself a "rock sitter" and often composes while he is out in nature in majestic settings such as the Sierras, Joshua Tree and Sedona. His first album, Path to the Heart, featured all original material played on solo flutes and it was a finalist in the New Age Voice (NAV) Annual Music Awards for "Best Meditation Healing Music". His second release, Walk Between Worlds, debuted on NAV's Airwaves Top 100 chart at #2, stayed in the Top 40 for five months, and also won The Coalition of Visionary Retailers' 2000 Award for "Best Native American Music". The album also received a prestigious nomination for "Best Instrumental Record" in the upcoming 3rd Annual Native American Music Awards. On Walk Between Worlds, Golan? began sharing producer and arrangement credits with keyboardist and guitarist David Chamberlin, who added his instruments to the fuller ensemble sound they were creating. This ensemble mix continues on Feather on the Wind with Golan? 's various flutes backed by one or two instruments on each song including acoustic guitar, acoustic grand piano, electronic keyboards, violin, cello and hand drums. In addition to six original tunes, Golan? co-wrote "Above the Sky" with contemporary jazz keyboardist Armen Chakmakian (formerly with Shadowfax). Golan? also commissioned compositions from new age recording artists Michael Hopp?, H. Scott Hartley and Suzanne Doucet. All four of these composers also perform on the album. Plus Golan? covers the contemporary gospel-music classic, "Alleluia," in which he plays hauntingly-entwining four-part flute harmonies. Other highlights on the album include "Closer To You" (a love song with the flute backed by multiple guitars), "As Long as the Waters Run" (a memorial to all the Native American treaties and promises broken by the government, but also for everyone who has ever felt a sense loss and betrayal), and "Walks Alone Man" (Golan? 's most personal song on the album where he uses three different types of flutes playing in harmony). think about things in their life." Although now renowned in the field of Native American music, Golan? 's path had a much different beginning. He was born and raised as Scott Cunningham in the city of Ontario in Southern California as part of what appeared to be an Anglo, Protestant, religiously-strict family. It wasn't until a few years ago that he discovered his great-great-grandmother, Olevia Evans, was a full-blooded Cherokee. Although his family never acknowledged the native part of their history when he was growing up, Scott's love of nature and music, and his pursuit of alternate spiritual beliefs that made sense to him, were always a part of his life. Scott's first musical influence was church hymns ("I still love to play them"). When he was eight, he began a four-year stint of piano lessons followed by four years of trumpet-playing in school bands. When he was 15, he began playing guitar, but he spent most of his time outside playing sports. However, he always had a strong love for music as a listener. "When I was young, I liked anything with acoustic guitars, harmonies and flowing melodies, especially Crosby Stills Nash & Young, Jackson Browne, Van Morrison, Dan Fogelberg, The Eagles, America, The Marshall Tucker Band, Jimmy Buffett and the more-acoustic songs of Led Zeppelin and the Moody Blues. Today I can hear many of those influences in my music along with early Windham Hill artists like George Winston, and musicians I have turned to in more recent years like Native American flutists R. Carlos Nakai, Robert Tree Cody and Perry Silverbird." Cunningham attended San Diego State University and graduated with a Bachelor of Science Degree in Information Systems Management. Later he received his Masters in Systems Management from the University of Southern California (USC), the first student to receive that degree with a 4.0 grade-point-average. While living by the ocean during college, Scott became an avid surfer ("for 15 years there was no place I would rather be than on my board in the ocean"). Scott also enjoyed hiking, biking, running and swimming, so he participated in triathalons and marathons. "I always gravitated towards solitary sports that brought me outdoors into nature and offered long periods of quiet time for thought and reflection." After years of trying to fit into the corporate office work world (a period of drug and alcohol dependency), Scott changed his life, started his own computer software consultancy business, and began hunting for a new spiritual path. That exploration included a look at Native American history and spirituality. He began reading Black Elk, Rolling Thunder and Tom Brown, Jr. Scott moved away from the ocean "and began the mountain and desert phase of my life" which included hiking, camping and long meditative walks. He met with Native Americans living in California and also went on archeology trips in the Southwest to study the ancient Anasazi Indians. He took nature classes, studied plant uses, learned how to build shelters in the wilds, and practiced animal tracking. After his family became aware of his passionate interest in American Indians, his aunt casually mentioned to him one day about their family's heritage. "I almost fell out of my chair. This light came on and so many things finally made sense in my life. It all meshed. The way I looked at life, especially spiritually, was in my blood, but I was the first person in four generations to care about that part of our family's background." But Scott's spiritual quest was far from over. "I wanted to find out what I could do with my life, what I could add to the world that would make it a better place. One day, at a nature class, I was walking down a road by myself asking the Creator 'Why am I here?' when I heard someone playing a Native American flute about 200 yards away. I was drawn to the sound. I spoke to the musician and soon after that I took a flute-making class. Later at a powwow I bought a good wooden flute. One time when I was really hurting inside, I went out into a field where I prayed and asked for help. Then I started playing the flute and I poured all my feelings into those notes. The beauty of the sounds made me realize I wanted to pursue flute playing." Scott began taking his flute everywhere with him, playing it as much as possible. He played at parties, weddings and hospitals. People began asking him if he had any of his music recorded so that they could buy it. This inspired him to make his first album. Finally, Cunningham attended a special ceremony where a Cherokee elder gave him his Indian name, Golan? (which means "Raven"), and told him he would one day serve as a messenger between the spirit world and this world. "A decade-and-a-half ago I had no idea I would be a Native American flute player. I couldn't have gotten from where I was to here without something bigger than me being involved. That's why my music is so spiritual. I have the Creator to thank for where I've been led and for what He's given me."